While many genealogists will stop their search for online vital records after reviewing the commercial site Ancestry.com and the Mormons’ FamilySearch website, there are a multitude of other places on the internet where one might find birth, marriage and death information. This lecture reviews and illustrates the breadth of other vital records sources available, including other online genealogy sites; local, county, and state level public agencies; and from public, university and college libraries, and historical and genealogical societies. Ted Gostin has been conducting genealogical research since 1980, and has worked as a full-time professional genealogist since 1994. 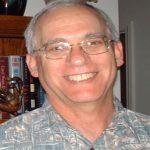 He has twice been President of the Jewish Genealogical Society, Los Angeles, and has taught genealogy for several adult school and university extension programs. Ted has helped plan and organize three national genealogical seminars, and has been a featured speaker at a half-dozen such conferences. He lectures widely on Jewish genealogy, Southern California resources and naturalization and immigration records. He is the author of Southern California Vital Statistics: Volume 1, Los Angeles County 1850-1859, and the owner of Generations Press publishing company. He was a featured researcher in the Larry Lamb episode of the BBC version of Who Do You Think You Are? He is very active in the international Jewish genealogical community, and maintains contact with genealogists throughout the world. He is also an active member of the Association of Professional Genealogists.